Save your Straw & Hay Save £1000s! Benefits - Why Cover Hay and Straw? Protecting your Hay & Straw stocks from the weather is essential for almost every farmer. 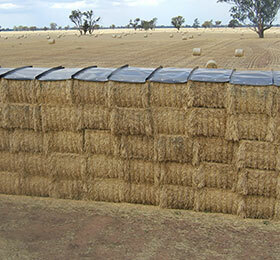 If good dry Hay & Straw bales are damaged by rainfall they can quickly become an unusable, unsaleable product. For every 1 inch of rain that falls on an exposed 8’x4’ bale 75 litres of water is absorbed. When the moisture within the bale starts to heat up, mould can begin to spread throughout the stack causing the bale to rot and become unusable. Using Hay Cap not only helps to protect your produce, it can help to protect your profits. Why Should I Use Hay Caps?